Drawing on fit theory and the revised achievement goal theory, this study investigates supervisor–sales rep fit for innovation commercialization according to three goal orientations: learning, performance, and failure avoidance orientation. 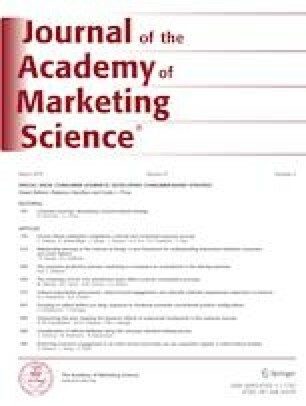 Two large-scale dyadic studies of a total of 387 supervisor–sales rep dyads revealed that supervisor–sales rep fit strongly affects the sales success of innovations but only negligibly influences the sales success of established solutions. Further investigations showed that this difference occurs because both supplementary and complementary relationships between supervisors’ and sales reps’ goal orientations can alter reps’ role stress regarding innovation selling. Moreover, results reveal that firms can magnify the effects of supervisor–sales rep fit on innovation sales success by tying sales reps’ variable compensation more closely to innovation sales. Results also show that firms interested in reducing the negative consequences of a problematic supervisor–sales rep match should facilitate and encourage supervisors’ appreciative communication with the sales reps. The online version of this article ( https://doi.org/10.1007/s11747-019-00644-y) contains supplementary material, which is available to authorized users. Michael Ahearne served as Area Editor for this article. The authors thank Arnd Vomberg, Jana Prigge, Marcus Theel, Sina Böhler, and Nathalie Harz for their helpful comments on previous versions of the paper. The valuable discussions with Stephan Ulbrich are also gratefully acknowledged. Finally, the authors thank the review team for the constructive suggestions. BASF (2017). Innovation sales specialist. (Accessed on 14 May 2017), [available at https://basf.jobs/north-america-bc/job/Vidalia-Innovation-Specialist-Louisiana-%28Remote-Position%29-LA-71373/341711701/?feedId=111101]. McKinsey (2010), “Innovation and Commercialization, 2010: McKinsey Global Survey Results. (Accessed 13 Dec 2017), [available at https://www.mckinsey.com/business-functions/ strategy-and-corporate-finance/our-insights/innovation-and-commercialization-2010-mckinsey-global-survey-results]. PWC (2013). Unleashing the Power of Innovation. (Accessed 13 December 2017), [available at https://www.pwc.com/im/en/assets/document/unleashing_the_power _of_ innovation.pdf]. SAP (2017). Innovation Sales Engagement Manager. (Accessed 14 May 2017), [available at https://jobs.sap.com/job/WalldorfSt_-Leon-Rot-Innovation-Services-Sales-Engagement-Manager-%28SSEM%29-Senior-Expert-%28wm%29-HCM-Cloud-SuccessFa-BW/341404501/]. United Nations (2017). Years of Schooling. (Accessed 14 May 2017). [available at http://hdr.undp.org/en/content/mean-years-schooling-adults-years]. Vattenfall (2017). Manager Intelligent & Innovative Sales (Smart & Innovative Sales). (Accessed 14 May 2017), [available at http://www.stepstone.de/job-search%2D%2DFachbereichsleiter-in-Intelligente-Innovative-Vertriebs-Konzepte-Smart-Innovative-Sales-Hamburg-Vattenfall%2D%2D4281403-inline.html]. World Bank (2017). GDP per capita (current USD). (Accessed 14 May 2017), [available at http://data.worldbank.org/indicator/NY.GDP.PCAP.CD].